I’m not going to dwell on the past when the current 8th Ward alderman tried to get a Marijuana Medical Clinic in the community stealth mode, until a woman with much more interest in the community and its preservation and revitalization was monitoring City Hall and the Zoning Department updates for the community. 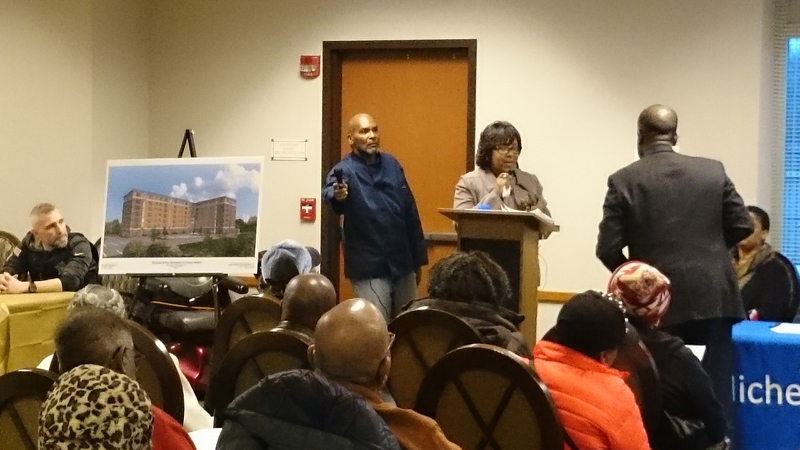 I won’t talk about how the same 8th Ward alderman is now up to the same old tricks by trying to sneak another project into the community – a one and two bedroom low income housing project aligned with Pill Hill homes worth hundreds of thousands of dollars. Many of those homes were built by families that still occupy them. 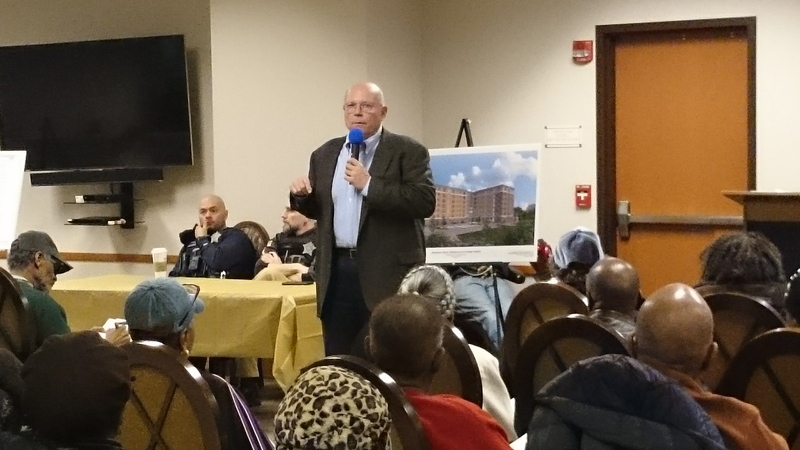 While I support looking out for the welfare of our seniors, taking away valuable property meant for businesses to populate Stony Island Avenue and keep it vital is deplorable. Certainly, there are other areas, especially along east 95th that are long overdue for improvement, and there are strip malls, a pharmacy and restaurants in walking distance on the business side of the street. Further, if that office is supposed to be proud of this project as stated by the 8th Ward Alderman during last week’s community meeting, I find it interesting that this is not featured on the home page of the Alderman’s website, but others are. They want to turn a quiet family friendly area into a transient community. Perhaps, it was a convenient oversight. Hmm, your most proud accomplishment you worked really hard on after 12 years of sitting in a seat unopposed, and feel people should have “a little more faith” in you with a history of lacking transparency, being deceptive and obviously some personal agendas. “All residents must pass a criminal background check,” but not their visitors and potential sublets don’t. The features and amenities in the building are for the residents, not the community. Phase one must have slipped under the radar. Phase 2 would have also slipped under the radar, too, if not for a very active community activist named Linda Hudson. Wake up people! We can’t continue to let things go business as usual. If you don’t believe the community is rotting, take a look at the businesses along a once vibrant and booming avenue. Stony Island Avenue leads into Bishop Ford Highway on the South end and Lake Shore Drive on the North. What other streets in the city can claim that!? The Alderman moves under the radar unopposed making light of peoples’ fears with jokes and sarcasm, is not the answer Alderman, especially when you have a history of this. It’s like trolling the community, and it further shows the lack of recognizing valid concerns, fears and input from the community. Is a candidate that runs unopposed necessarily best for the community, especially if they feel grandmothered into a position? Is business as usual the best for a once booming community that flourished and now appears run down with uncared for structures, many terrible pothole streets and a neglected business area. Why would a Dunkin’ Donut be allowed to build at the edge of a parking lot with traffic obstructed and backed up daily off Stony Island when it could have taken advantage of some of the vacant property on the avenue with room for expansion? The right businesses increase property value. Perhaps, businesses should have been pursued to take on the so called “swamp lands.” There were businesses there before that included restaurants and a motel. 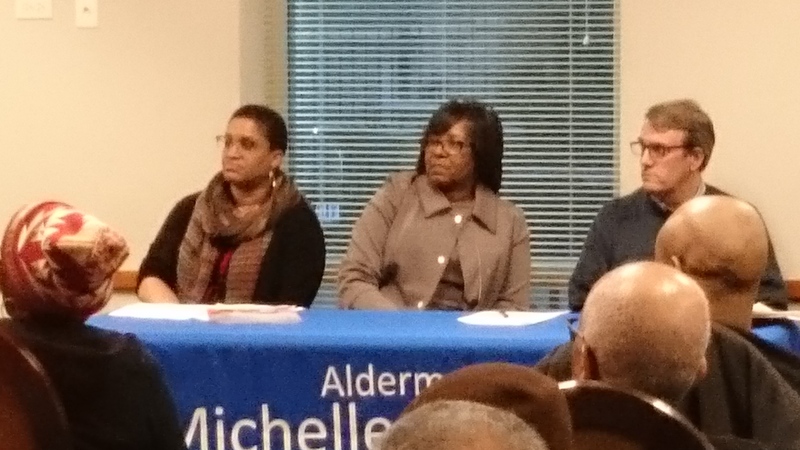 Another concern is the public verbal spanking of black contractors the Alderman gave and why they aren’t included on jobs, and how training courses had to be given to them to teach them things they did not know. Really, Alderman? You are going to single out Black contractors as a whole, and talk about them not being suitable? I find it hard to believe there are no qualified Black people available to take on those projects professionally. Does that mean I should avoid giving work to any Black contractor I come in contact with in Chicago? At your so-called informational meeting, all of this was done in front of the non-black developers and police officers in the room. Lazy, uneducated black stereotypes were being perpetuated in front of guests, the very people involved with the development of the 7 story monstrosity with a price tag of $38.6 million dollars that will be looking over Pill Hill backyards and homes. When a concerned resident said she lived on the property line where the building was being built and that she was concerned about her privacy. I heard someone shout. “They won’t see much.” Guess they never heard of a telescopes and binoculars. I would be very concerned if I had children living on property where people can watch them from their windows. At that height lives can be easily monitored. It was also mentioned that a certain ward didn’t want the Kroc (McDonald’s!) center, and they found an alternative space in another ward. I could not help but wonder why efforts weren’t focused on pursuing that center by the 8th Ward alderman for education and business empowerment of the community to serve many, instead of a few. Why didn’t the 8th Ward fight to get the Kroc community center? The area has needed a community center for decades. Why aren’t the young people, especially teens being provided safe places to go hangout after school and during the weekends to learn things like economic empowerment, crafts, physical fitness, sports, business, etc.? They are the future of the community. If you are a citizen concerned about an area once zoned for single family homes and businesses being changed to include this building, show up at the next zoning meeting scheduled for April. 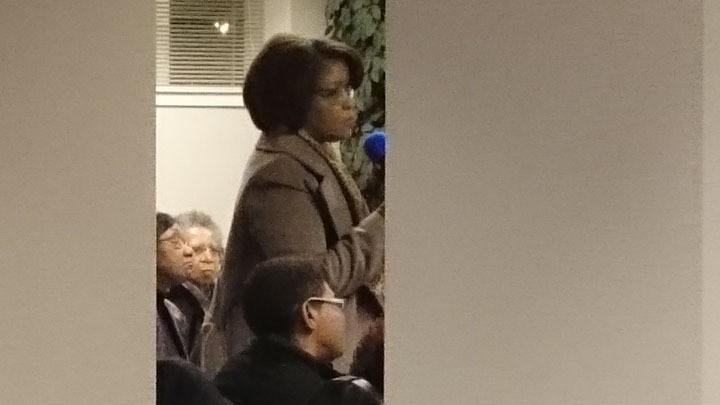 Linda Hudson, Concerned Citizen and Community Activist was in the audience asking questions. “Energy flows where attention goes.” So I will not focus all of my energy on what people in the community do or do not want. I’d rather focus on what the community needs, and that is an 8th Ward alderman that understands the importance of transparency, honesty and really assessing what the community wants and needs without focusing on gossip and rumors, jokingly wasting time instead of easing trouble minds that have good reason to be troubled. That’s what secrecy and lack of communications brings about. We need a person that won’t make fun of their community, but inform them. Our youth, especially the overlooked teenagers, are very important to this community. Many of them vote too. Give our young people a place to socialize and learn things about business startups, incubators, activities that include recreation, fitness, education outside of school like other neighborhoods and stores and restaurants like the ones they frequent outside of the community so they can buy and put money back into the community. They shouldn’t have to go downtown, south suburbs, north or Hyde Park to find mentors, coaches, prospective project team members, business partners, etc. and to have a good time. What can the 8th Ward provide for these young people to learn how to hold on to the homes in their community, maintain the ones handed down by their parents and provide for their future? We need someone that knows joking sarcastically about gossip and making fun of people as a platform to stay in office is not good strategy. It makes them look petty and unprofessional to entertain rumors and have an easily bent ear. 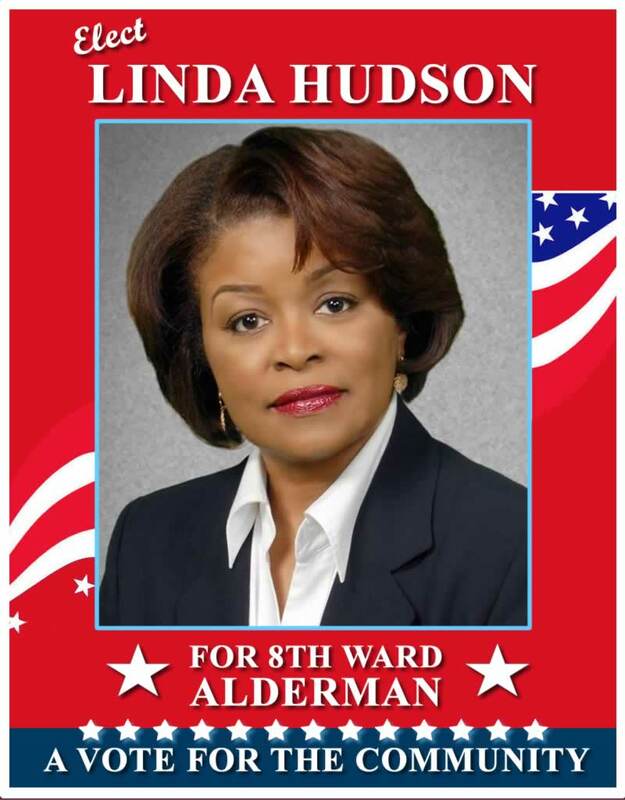 We need someone that knows that behavior and the aforementioned are unacceptable, and that is why we need Linda Hudson for 8th Ward Alderman. “It’s Time for Change that benefits the community as a whole, and not a few! Chicago, IL – This is the ideal time to stock up on books by Author & Publisher Juanita Bratcher. Bratcher has been an Award-Winning Journalist and Publisher for 41 years. These books also make great gifts for any occasions. Harold Washington, Chicago’s greatest mayor, was the first African-American elected mayor of the City of Chicago. Washington accused the Vrdolyak ’29, headed by then Alderman Edward Vrdolyak, of a nervous reaction to his administration’s reform process. Vrdolyak tried to sabotage every agenda Washington tried to put in place or change. Stroger spent almost four decades in public office. He was elected as a Commissioner to the Cook County Board of Commissioners in 1970. He served as ward committeeman before becoming a commissioner. During his 24 years as a sitting commissioner and then heading up the powerful Finance Committee, Stroger made a run for President in 1994, and won. At the age of 77, Stroger was running for a four-peat term in 2005. He said he was running for re-election because he had a vision for County for the next four years. The perfect gift for Valentine’s Day and an ideal gift for anniversaries, special occasions, birthdays, etc. Can’t say what you’d like to say to that special person(s) in your life? A Celebration of Love is a book of love poems for Lovers at Heart. This is a Tel-A-Luv book. So buy the book and celebrate love with that significant other. They got game! Seven women (red-hot mamas) all living unstable, unsavory lives with sordid pasts, find themselves pawns in the middle of a vicious and controversial scandal. A spellbinding novel, a story about love, courage, deception and triumph of a wealthy black family in crisis. Robert and Patricia Nemac, patriarch and matriarch of the Powerful Nemac clan, had positioned themselves to blow the lid off a dark, family secret, one that would rock the foundation of the powerful Nemac Empire, and jerk at the nerves of every family member. It is a powder keg waiting to explode! An albatross around their neck! It is a rude awakening for Robert Nemac, the patriarch of the rich Nemac clan. With one flame dead and another one carrying his baby, he is caught in the crossfire of murder, fatherhood, and the scorn of his wife over his dead mistress’ child, and his infidelities. In the end, he wages an all-out battle against his mistress’ fiance for custody of the child he fathered, against his bitter wife’s wishes. At the same time, he tries to earn back his wife’s love and respect. What happens when love goes wrong? A passionate, romantic love affair goes on the skids. Can it be saved? Dr. Cal Laney, a medical doctor, is fit to be tied when he goes on a wild goose chase in search of his former sweetheart (Lori Russell) who disappeared without a trace for more than a decade. He finds it painfully agonizing to allow himself to be this uptight over a woman whose disappearance has put him through nothing short of a living hell and pushed his life into mental turmoil. When he finds her, he gets the biggest shock of his life when she reveals a secret to him he never expects to hear, leading him to demand answers for this untimely revelation. Will he end up finding solace in her arms, something he has desired for the last ten years? Or will he have a change of heart and make a beeline right into the arms of another woman who’s been waiting in the wings for his love and affection? 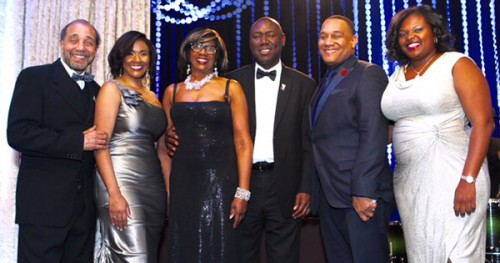 Dr. Cal Laney is one of six professional black men (known as the Super Six, powerful and modestly wealthy, who has bonded over the years in an enduring, longtime friendship. When the going gets tough they can count on that solvent friendship to see each other through. So when Laney’s love life has some very daring and traumatic moments, in dire need of some sexual healing, he reluctantly seeks the advice of his buddies about his wanton love affair. He finds their responses quite mind-boggling. Will he abandon their advice altogether? Or will he pick up the pieces and try to mount them back together again? PETAL et al’s team jammed the weekend (January 20 – 22, 2017) at the UNC Chapel Hill site in North Carolina. The team of three with one guest team member presented two video games (one being a simulation) within 48 hours. In addition to GML (Gamemaker Markup Language), PMac provided for Inchworm, she also contributed background vocals to a third game during the jam known as “Wet Willie” for one of the other teams. 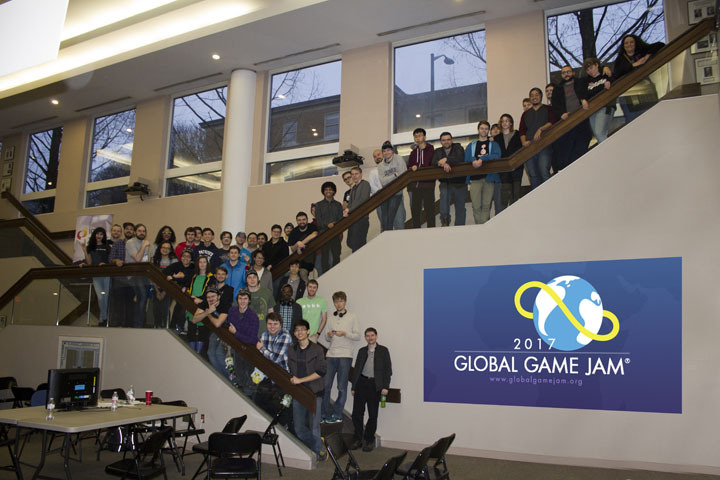 Global Game Jam is an annual event held toward the end of January whereas developers all over the world come together and develop games within 48 hours during the weekend at different sites across the globe. It is not a competition, but a collaboration where people work together to get games completed. 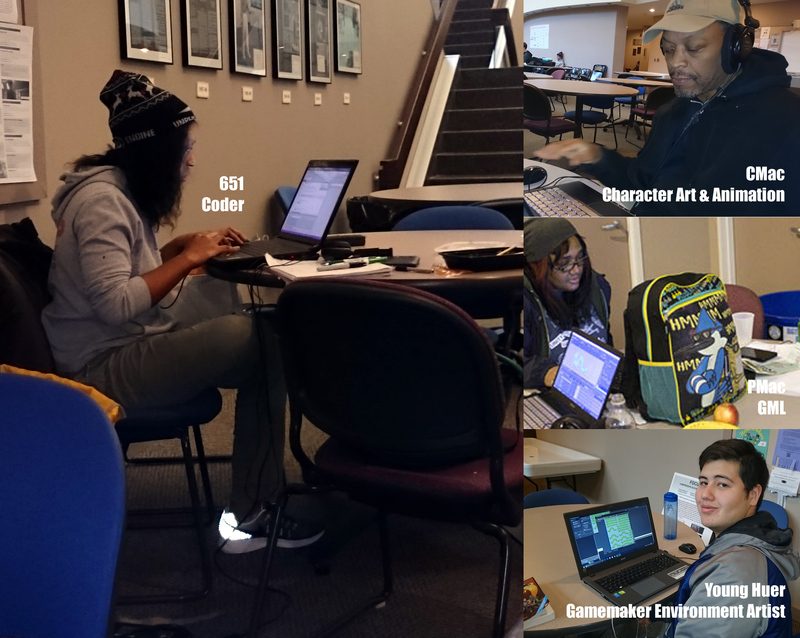 There were 68 participants at this year’s Global Game Jam’s Chapel Hill site. 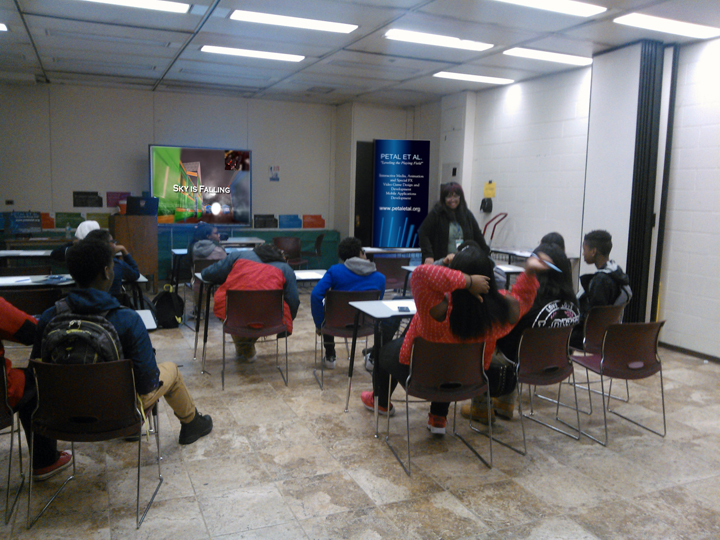 PETAL et al., in collaboration with CopyLine Magazine, was a guest presenter for Junior Achievement at Percy L. Julian High School in Chicago. PETAL et al. CEO Pamela McMillan & Vice President of Technology and Communications Clarence McMillan, along with Copyline Magazine Editor and Publisher Juanita Bratcher, met with groups of students throughout the day discussing career goals and paths taken to get where they got in their careers. Ms. McMillan also shared strategies for students to start teaching themselves about things they want to know before starting college, urging them to take advantage of online learning and networking opportunities. Ms. Bratcher discussed her career, shared some of her publications and tips on becoming a writer and published author. Pictured above: Pamela McMillan, PETAL et al. CEO speaks to a group of students at Percy L. Julian High School. Real Men Cook — Chicago’s premiere urban Father’s Day charity event – will depart from past years’ formats by holding the much-anticipated event at 27 venues citywide/suburbanwide. These individual celebrations will be hosted by agencies and entities committed to the mission of Real Men. Partners will maintain the Father’s Day tradition created by Real Men Cook while incorporating their own style and traditions. All events will be held on Father’s Day, June 19, from 3-6PM. 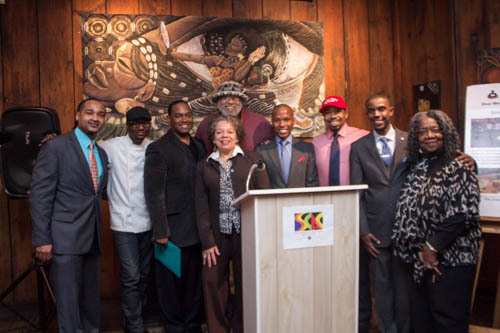 Yvette Moyo and Kofi Moyo-co-founders of Real Men Cook and Rael Jackson, president, made the announcement during a press conference held at the South Side Community Art Center. Some of the hosts/partners were in attendance to express their commitment as event and venue hosts. All shared their eagerness to be part of the new direction. Ms. Moyo said that the new format would allow the event’s message to have a broader community reach as it expands the Father’s Day tradition of family and community food-fests. Julian Valentine, who grew up with Real Men Cook and began attending when he was 12 and was the youngest chef at 13, said he was so inspired by the event and by the love of the founders, that he became a chef. He is now a sous chef at Nordstrom’s Café. He shared the Real Men Cook philosophy that “food brings people together.” At the press conference, he served samples of his dishes, including a kale salad, which has been a highlight in the organization’s healthy mission and has been featured at every Real Men Cook event since 1999. Among the Chicago communities where the celebrations will be held thus far are Englewood, Chatham, South Shore, Hyde Park, Lawndale, Bronzeville, Auburn Gresham and Park Manor and more. There will also be events in South Suburban cities and other outlying areas hosted by elected officials and community organization leaders. In these individual sites, men will serve in churches, fraternity houses, homeless shelters, their blocks, backyards, homes and parks. At each location, they will demonstrate that Real Men Cook, Love and Care. The events will continue Real Men Charities’, Inc. tradition of promoting health and wellness, prevention and awareness for families and children. Accordingly, each locale will serve healthy foods and broadcast the message that food is medicine. Activities for children, also a Real Men Cook tradition, will continue. Some of the partners at the conference who are among the 27 hosts were: Demetrious Walker of Fathers & Blessings, “a south suburban-based organization that seeks to unite Fathers and Blessings as one for a change;” Minister Jeffrey Muhammad of Mosque Maryam whose members will manage the event at that location; Jerald Gary, Chairman of the Chicago Regal Foundation, operator of the Avalon Regal Theater and David Peterson Jr. President, National A Philip Randolph Pullman Porter Museum, will also host the event at their respective venues. Each of the partners expressed their commitment to the Real Men Cook mission and vowed to maintain the tradition at the sites they will host. Real Men Cook is the largest, longest-running and most-anticipated Father’s Day celebration of its kind. It provides a platform where “real men” from all walks of life are honored for demonstrating extraordinary commitment to their families and to their communities. In keeping with Real Men Cook’s core mission. Each venue will award men for the contributions they have made in their communities. Some of the high-profile men who have donned a chef’s hat and participated in the past include U.S. Senator Barack Obama, Congressmen Danny Davis, Congressman John Conyers, and John Lewis. Senate President Emil Jones and his son Senator Emil Jones and Rev. Jesse Jackson, Sr. and his sons, former Congressman Jesse Jackson, Jr. and Professor Jonathan Jackson have also joined in past celebrations. 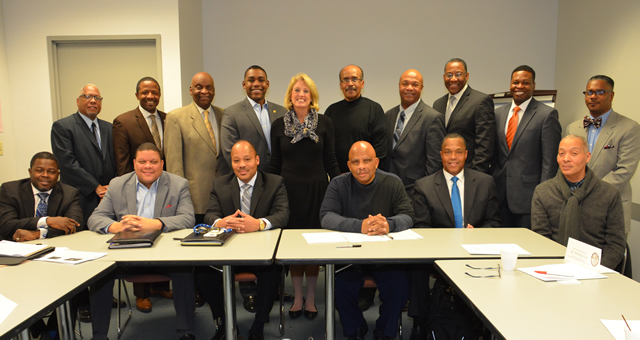 CHICAGO, IL – Illinois Comptroller Leslie Geissler Munger met with her African American Advisory Board at the James R. Thompson Center on Thursday and highlighted the importance of open communication between government and community leaders in these tough economic times. In a successful first meeting, the Board made introductions and got right to business discussing the state’s financial situation. The group spoke about the effects of state payment delays and shared strategies for helping small and minority owned businesses thrive. Meetings will continue to be held to keep an ongoing dialogue. 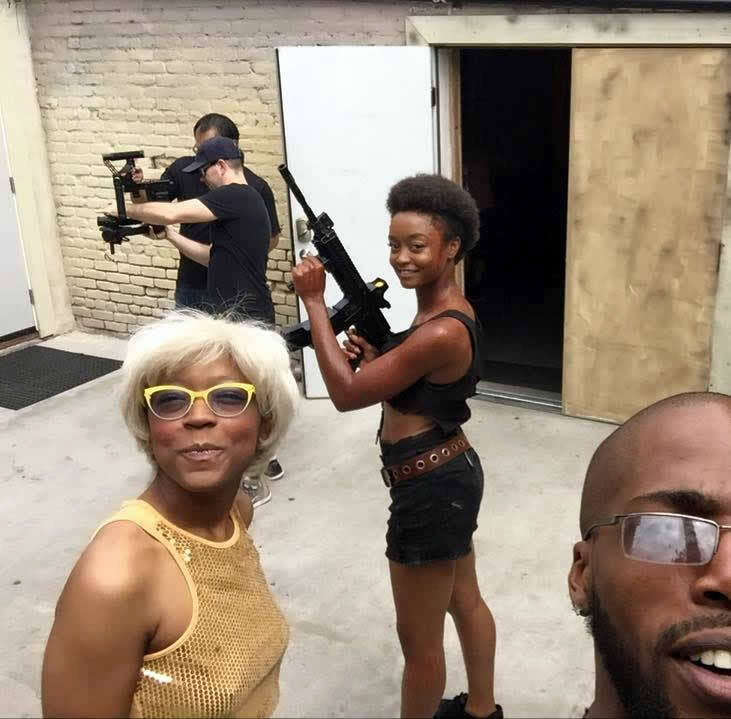 Western in Noir, a musical feature film with elements of diversity and social justice, was written by a 29-year old African American Writer/Musician who is fighting a battle with Stage 4 Breast Cancer. 1 Drop Rule Productions has launched a crowd funding campaign for Western In Noir, a musical feature film with elements of diversity and social justice. The film and soundtrack, owned by the cast and crew, is directed by an all female crew – Michele McMillan, author/producer/film maker; Award-Winning Editor and Director Jennifer Barlow, and Rachel Dunn, Director of Photography. This all female crew is creating a haunting, realistic vision of America at its weakest in a hacker torn, vigilante ruled future where hearsay can be deadly. The official trailer will be released on Youtube on New Year’s Day. Western In Noir is a musical film in the vein of Carmen or Pink Floyd’s the Wall. It takes place in a vigilante-run America, after hacks and a failed presidential campaign escalate an American revolt. This film is a commentary based on the differences in challenges faced by Americans, and a plea for reform. 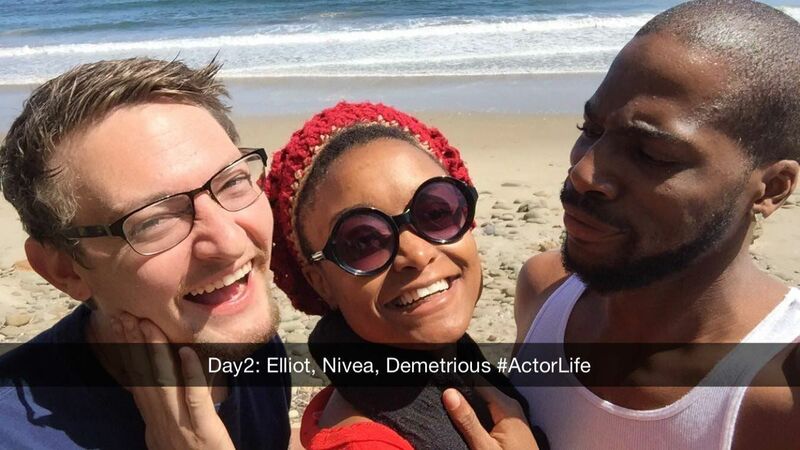 It features a diverse cast. Spawned by the disappearance of Skip Hutch, the social media fueled presidential hopeful, hackers and malcontent citizens escalate a civil war. Years after the violence settles, people are slowly beginning to trust each other and build again. The CEA, a promising new regime, recruits Elliot to scout the western part of the country for survivors. After stopping in a small church-run town, he meets Nivea, a knife fighter and farm owner who lives with her friends and former lovers. One day, a bounty hunter shows up for Elliot and he discovers that a small misunderstanding has snowballed (or tumble weeded) into a crusade against him funded by a group even stronger than the CEA… the church. While fleeing the farm, he is captured by the Grinch and his gang. Meanwhile, Nivea and her farm crew are all shipped back to her hometown, which was turned into a place for non-violent criminal rehabilitation during what some called “the Great Revision.” Run by the Congressman and his family, home is not what it used to be, and she finds herself working in a brothel called the Mangy Dog. The soundtrack for the film contains original opera, hip hop, and electronic music, as well as several choreographed dance numbers. 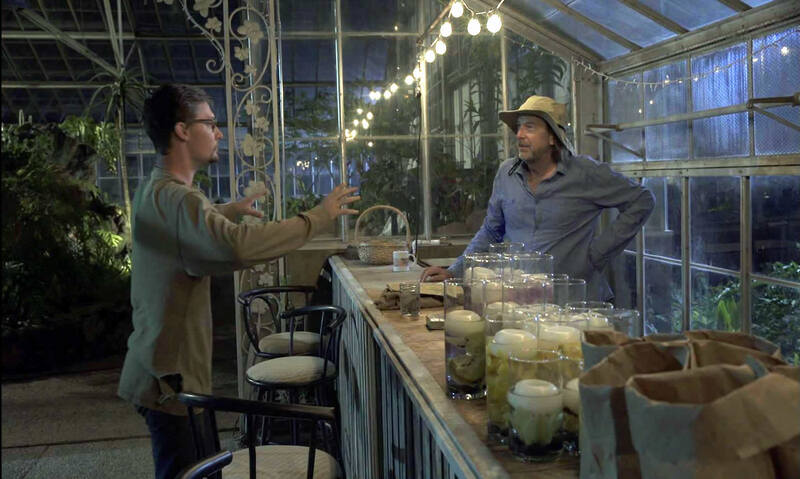 While the project has been described to date as very “real,” the film makers are considering going to a darker, more fantasy direction, if funding is secured. Western In Noir can be watched with or without music video sequences, and the soundtrack includes opera, hip hop, blues, and more. Soprano Nique Wheeler sings the voice of Risky, featuring composition work provided by D_Elete, Ian D, Joe Andolino, and more by the team at Scoreascore.com. “This project means a lot to me,” said McMillan. “We hope to build on our history as musicians and music video makers. The film is currently in production, and we are looking for funds to pay cast members, obtain permits, licenses, insurance, catering, props, locations, music, and other costs associated with the film. Interested parties can follow the women film makers online, or join their email list on coolaidhouse.com. or go straight to the donation page at http://www.hatchfund.org/project/western_in_noir. 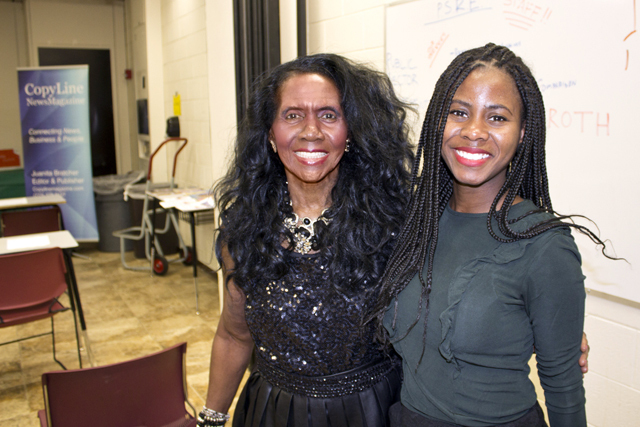 A large portion of McMillan’s share of film proceeds will go towards rehabilitating some properties on Chicago’s South Side, and to the scholarship funds of Neal Bratcher III, and Quinn Heneghan, the son of her late friend Brett “Brett Brett” Heneghan. The rest of the proceeds will go to the cast and crew who will be owners of the film as well. For more information or to make a donation to Musical Film Western In Noir, you can also email McMillan or phone (773) 818-4759. Secretary of State Jesse White joined with Christian, Jewish, Muslim and Sikh faith leaders to show religious support for organ/tissue donation and recognize National Donor Sabbath, an interfaith campaign aimed at educating religious communities about organ donation. During the weekend of November 13-15, faith communities in Illinois and across the country recognize National Donor Sabbath. Faith leaders and congregations participate in services and events to show religious support and increase awareness of organ and tissue donation. White is at podium, pictured from left to right: Kevin Cmunt, CEO Gift of Hope; Ed Young of SGI USA Buddhist Center; Bishop Lance Davis, of the New Zion Covenant Church in Dolton; Rev. 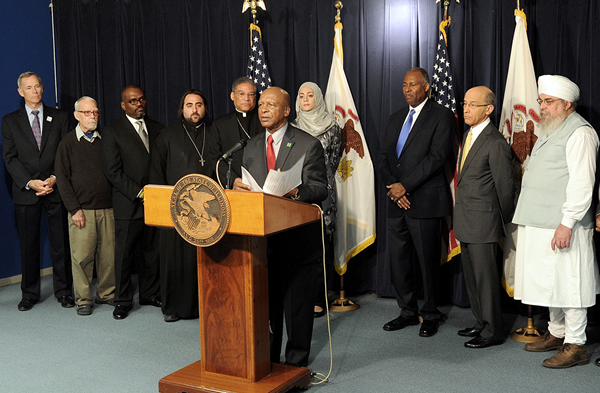 Father Chrysanthos Kerkeres, senior priest at St. George Greek Orthodox Church; the Most Reverend Joseph Perry, Auxiliary Bishop of Chicago, representing Archbishop Blase J. Cupich, Archbishop of Chicago; Reem Hobeldin of the Council of Islamic Organizations of Greater Chicago; Pastor Myron McCoy, senior pastor at First United Methodist Church at the Chicago Temple; Rabbi Michael R. Zedek of Emanuel Congregation of Chicago, a senior rabbi, scholar, teacher and civic activist; S.S. Shiva Singh Khalsa, a Minister of Sikh Dharma International and President of the Spirit Rising Foundation. Earlier this month, Rep. Jan Schakowsky joined President Obama, civil rights hero Rep. John Lewis, and many others in Selma, Alabama, to honor the Voting Rights Act and the brave individuals who fought and sacrificed to expand civil rights in our country. Donâ€™t forget the incredible progress that we, as a nation, have made. More importantly, donâ€™t forget about all the work still in front of us.